Fraud refers to malicious or erroneous clicks or impressions that are made with the intent of spending the advertiser's budget. Yandex.Direct takes the security of our advertisers very seriously and we employ anti-fraud technology at several different levels. This includes both automatic and manual filtration methods. Malicious clicks and impressions are filtered out at every level. They are not reflected in Yandex.Direct statistics reports, and funds are not withdrawn from the advertiser's account for them. At this stage, the system filters out clicks and impressions made by robots. Robots are programs that imitate the actions of an actual user. They can be used to spend an advertiser's budget or ruin the CTR for ads. Then, in online mode, the system analyzes every impression and click by checking them along a list of 250 different characteristics. These characteristics include: time of day, season, geography, certain events leading up to the click, etc. The list of these characteristics changes based on long-term studies of trends in user behavior. At this stage, the system filters out clicks and impressions that were determined to be malicious based on the analysis of these characteristics. 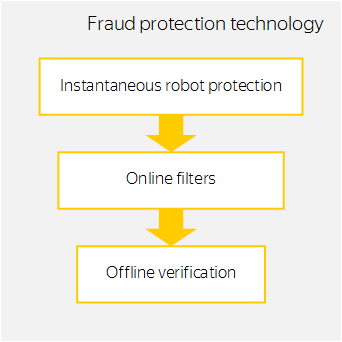 The majority of fraudulent traffic is filtered out during the first two stages. Then, at stage three, the system analyzes user behavior over time based on a complex of characteristics. The system analyzes approx. four billion events daily using clustering algorithms. This helps us discover and eliminate complex instances of fraud. Yandex specialists constantly track fraud and improve advertiser security. Expenses incurred due to fraud are refunded automatically to the ad campaign balance, and filtered-out impressions and clicks are deleted from all statistics reports. You can see the number of clicks that the anti-fraud system filtered out in the Statistics by day and General statistics reports under Invalid clicks for the whole period you selected. These figures may change over time if a portion of clicks are considered invalid during future filtrations. In part, spikes in the number of clicks or impressions may be caused by factors that are not fraud related. The most frequent reasons for spikes in activity are described in the I noticed a spike in impressions, clicks or expenditures section.